BYU's annual "Conference on Family History and Genealogy" is coming up (July 28-31, 2009). As always, we will be there to answer your Legacy questions. We hope you will stop by and say hello. Wednesday, July 29, 5:15-6:15pm, room 2260. 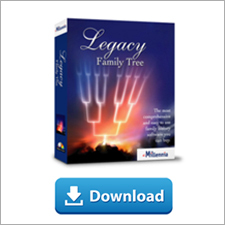 Overview of Legacy Family Tree 7.0, taught by Legacy-expert Leonard Plaizier. Leonard has served for fourteen years at the South Davis Multi-Stake Family History Center as an Advisory Council Member, Assistant Director, Technology Specialist, Conference and Outreach specialist. If you have not heard Leonard speak, don't miss this class. He has a gift for teaching. Thursday, July 30, 5:15-6:15pm, room 2258. Legacy and New FamilySearch, co-taught by Luc Comeau and Leonard Plaizier. Luc is our lead programmer responsible for Legacy's Research Guidance, Legacy Charting, and now Legacy's interface and synchronization tools with new FamilySearch. He will demonstrate how Legacy will interface with the new FamilySearch program. Although we have not yet released this tool to our Legacy users, attendees will get to see it in action (it's looking really good!). Leonard will present some great ideas about preparing your Legacy information to work more effectively with the new system. This should be a great class. Legacy classes and user groups are available in many different parts of the world. To see our upcoming speaking and conference calendar, please visit http://www.legacyfamilytree.com/Calendar2009.asp. 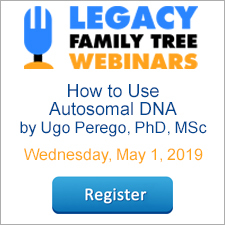 To see if there is a local user group, please visit http://www.legacyfamilytree.com/UsersGroups.asp.